The Indianapolis Colts today made an exclusive rights tender to outside linebacker Cam Johnson and made qualifying offers to restricted free agents cornerback Josh Gordy and guard Joe Reitz. The team also released center Samson Satele. Johnson was acquired by the Colts in a trade with the San Francisco 49ers on September 2, 2013. Last season, he saw action in 12 games and totaled two tackles and six special teams stops. He also contributed with three special teams tackles in two postseason games. In 2012, Johnson spent the first 14 games of the season on the 49ers practice squad before competing in the team’s final two regular season games. Gordy appeared in 12 games in 2013 and registered nine tackles (eight solo), three passes defensed, one interception and four special teams stops. He also competed in both postseason games and totaled eight tackles (seven solo) and one pass defensed. Gordy’s interception came in Week 4 at Jacksonville where he was part of a defense that limited the Jaguars to 165 net passing yards. Satele was originally signed by the Colts as an unrestricted free agent on March 21, 2012. In two seasons with the team, he started 24 regular season games and three postseason contests. In 2013, Satele started all 13 games he appeared in while making two starts in the playoffs. What are fans, media and players saying about D’Qwell Jackson? The news of D’Qwell Jackson agreeing to terms with the Indianapolis Colts has sparked some serious noise in the social media world. By all accounts, Jackson is a tremendous leader in the locker room and has not missed a start at the inside linebacker spot over the last three years. Jackson is an eight-year NFL veteran and based off what people are saying on Twitter, it’s pretty clear how much he is appreciated by those around him. “@JimIrsay: Welcome to the Colts, D'Qwell!” — Congrats Mr. Irsay…you just landed a helluva person/player..
Love this response from D’Qwell Jackson (@DQ52) during text exchange just now. Why the Colts? “Chuck Pagano. Great coach… Better person." Welcome to the @Colts @DQ52 You will be a HUGE asset! And you will LOVE the winning atmosphere!!! @DQ52 I met you in Kyrgyzstan on your USO tour. I'm happy for @Colts and for you. Welcome to Indianapolis! The Indianapolis Colts today agreed to terms with free agent linebacker D’Qwell Jackson. Jackson, 6-0, 240 pounds, started 96-of-97 games over the past eight seasons with the Cleveland Browns since being selected by the team in the second round (34th overall) of the 2006 NFL Draft out of the University of Maryland. He holds career totals of 891 tackles (566 solo), 11.5 sacks, 28 passes defensed, eight interceptions, including one returned for a touchdown, seven fumble recoveries and five forced fumbles. Jackson has posted six 100-tackle seasons, while leading the team on five occasions (2007-08, 2011-13). In 2013, Jackson started all 16 games and played in 1,149-of-1,150 (99.9%) defensive snaps. He ended the year with a streak of 48 consecutive starts, dating back to the 2011 campaign. For the season, he tallied a team-high 143 tackles (92 solo), 1.5 sacks, seven passes defensed, one interception, one forced fumble and one fumble recovery. He also topped the 10-tackle mark in seven games. 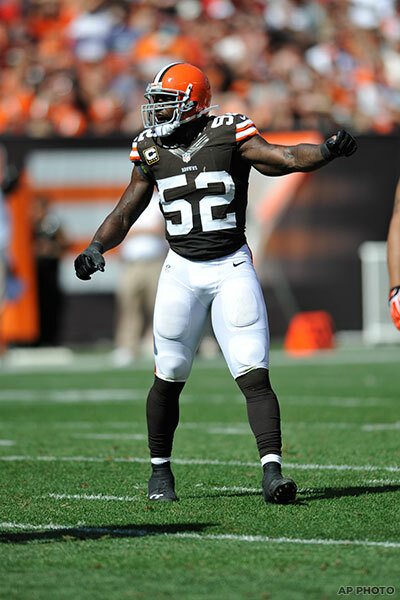 In 2012, Jackson earned the Browns Dino Lucarelli Good Guy Award and was named AFC Defensive Player of the Week for Week 12. In 2011, he was honored as the Browns recipient of the Ed Block Courage Award and garnered AFC Defensive Player of the Month accolades for September. Jackson registered career highs of 191 tackles and three interceptions in 2008 while starting in all 16 games.